・ The purpose of grinding processing is to produce high quality workpieces with high accuracy and efficiency. Especially for grinding, choice of palm is a major factor determining quality. ※ The inside of the Ao frame is the grinding stone attached to the machine standard. We are aiming to make custom-made products that correspond to the material of the workpiece, required accuracy, and so on. For details please consult GRIN - X 's catalog, your local sales office. CBN ・ Diamond wheels are widely used for grinding and hardening of hard materials, high hardness materials, brittle materials, profiling, grinding process such as groove grinding. Please refer to the table below when selecting the specification of the wheel. 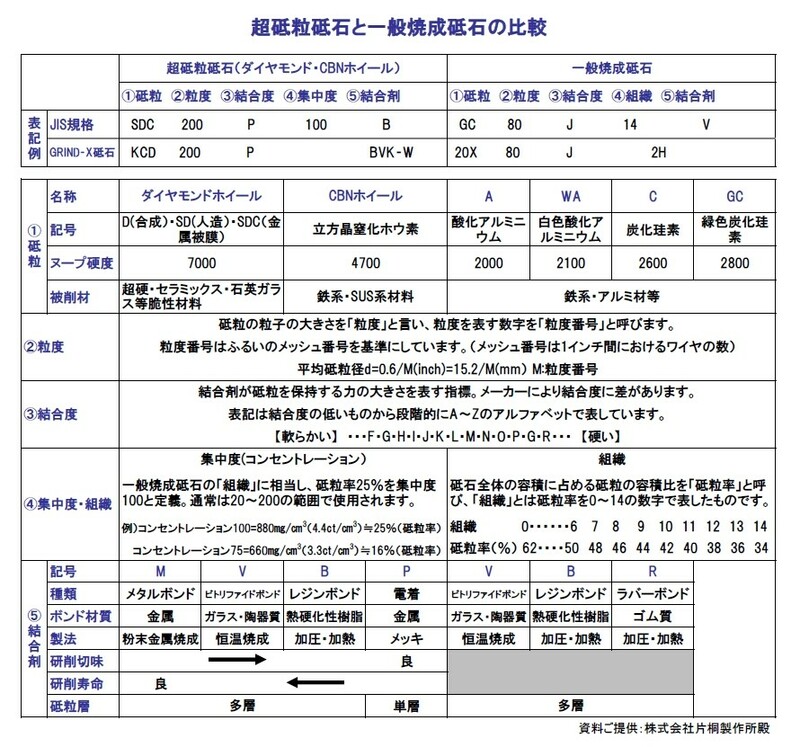 In addition, "degree of bond" ・ "grindstone size (outside diameter ・ width ・ abrasive layer thickness)" will be discussed separately. ・ Easy-to-understand dialogue. By following the instructions on the screen, you can easily and accurately perform balancing. ・ Because balancing is carried out with the brush attached to the machine in a rotated state, dynamic balance adjustment including unbalance of the machine and the shaft shaft system sensed by the vibration sensor is performed. ・We have a variety of meshes according to the compatible size and application of the water filtering equipment with paper filter currently in use. - It is used when filtering processing waste including nonmagnetic material and abrasive particle waste to improve surface quality. ・ There are three reference center holes on the dress arm and it is possible to select turning R, so you can shorten the distance to the dress point and dress accurately. ・ Diamond tool has a structure that does not scratch, and accurate dressing is possible. ・ Since the diamond tool holding shaft rotates, the position (angle) can be set arbitrarily. ・ When the sharpness of the diamond tool deteriorates, it is possible to change the position by rotating the holding shaft. ・ Angular shaping is possible from 0 to 45 ° and 45 ° to 90 ° using 2 rectangular reference surface. ・ Concave shaping of insecticide used for side grinding is also possible. ・ Accuracy improvement is possible. ・ The grinding fluid has characteristics of "cooling property", "cleaning property" and "lubricity". ・ A lineup of products suitable for the shape, accuracy and processing method of the workpiece is available. ・ It is designated hydraulic fluid which is adopted fully by our grinding machine. We recommend "GRIND-X Hydraulic Oil" for our grinding machine. ・ In addition to the structure that supports the whetstone with the vertical shaft, the special design of the motor built-in realized 3 times the rigidity of the conventional product. ・ Truing can be done about 5 times faster than conventional products. ・ In the horizontal axis type, the dressing / truing condition changes due to the speed change due to the outer diameter decrease of the dressing toilet, but the condition does not change in the vertical shaft type. ※ To use this equipment, "Toy axle continuously variable transmission" is a required option. ※ This photo contains options. ・ Innovative function expansion tool born from the mold manufacturing site. Rotating machining which is impossible in the past can be easily realized with high precision. ・ Semi-convex, medium concave machining is also possible by using the bar bar chuck. The forming grinding machine / surface grinding machine will be able to move in the same way as a small rotary grinding machine in 5 minutes. To crush the abrasive grains on the clogged face of the sprout to make a cutting edge. Make the shape of the palm concentric with the outer diameter of the brush and the center of the shaft. ※ The standard specification is set with 9 slide blocks, 3 reference blocks and 4 stopper blocks. Instead of spacers, shims, bean jacks etc. used in conventional warpage work, it is possible to apply the magnetic force of the magnet chuck and hold the invisible surface of the material as it is. Magnetic force is used only for holding jigs and is not transmitted to the material, so it is ideal for not only magnetic material but also non-magnetic aluminum, stainless steel, resin etc grinding. Grinding while retaining the incorrect surface of the material as it is, and also grinding while absorbing the strain during grinding ensures micron precision with a single grinding even for materials with large warp and twist. ※We are preparing different kinds of specifications of each size. Features What is CUBITRON TM II Wheel? Ceramics with precision molded abrasive using 3M company's core technology "micro replication technology (high definition surface technology)". We propose efficiency ratio grinding by collaboration with rigid grinding machine of Okamoto Machine Tool Machinery Works. ・ Compared to the conventional case, the penetration input to the workpiece is high, and generation of grinding heat is suppressed. This enables deeper cuts and high-speed feed. ・ The dress characteristic which is said to be weak point of ceramic abrasive grain also improved. Regenerate the edge from the flat surface of the triangle to recover sharpness, dresser wear is also reduced. ・ In collaboration with Okamoto Machine Tool Machinery Works, there are examples of surface grinding machine, cylindrical grinding machine, internal grinding machine, compound cylindrical grinding machine, rotary grinding machine, gate type grinding machine, gear grinding machine. For details, please contact your sales representative. ※Cubitron TM II is a product of 3M company. The swirling flow jet derived from the internal structure of GRIND - BIX ensured the grinding coolant liquid to spread to the tip of the abrasive grain by the Coanda effect, greatly improving the cooling capacity. As a result, cutting depth of 5 to 10 times is possible, contributing to reduction of machining time and improvement of accuracy. Secondary vibration when fine bubbles (bubbles less than several hundred nanometers in diameter) can be blown are constantly washed inside the pores, preventing clogging of the pins. As a result, the cutting edge is maintained, continuous grinding of several tens of microns is also possible without requiring sharpening even with # 2000 high mesh. ※ The effect of GRIND-BIX differs depending on the model, processing work, and use. ・ By developing the Ultra Screw which applies the screw rotating force only to one direction of pressing, the work can not be scratched and lifting at the time of work tightening can be prevented, so accurate chucking is possible. In addition, by mounting the resin work guard on the Ultra screw, the soft material will not be scratched. ・ It can be used as a reference block only on the main body because of the full circumference high precision grinding finish. ・ By developing the Ultra Screw which applies the screw rotating force only to one direction of pressing, the work can not be scratched and lifting at the time of work tightening can be prevented, so accurate chucking is possible. In addition, by mounting the resin work guard on the Ultra screw, the soft material will not be scratched. ・ There is an integral type and a division type, but the UVH - 40 of the division type and integral type has a structure that can be corrected and chucking is possible arbitrarily. ・ Excellent characteristics not only in accuracy but also in abrasion resistance and rust resistance. ・ Gauge block is used for angle setting. ・ It is a mechanism to clamp the gauge block between the stage and the roller, and stable accuracy can always be maintained. ・ Handles attachable / detachable type and fixed type 2 models are available. Handle detachable type is effective in narrow space.